Welcome back to Daniel Sloane-Saurez’s MLS adventure with FC Dallas. In the previous update, we fought our way through the MLS Cup but ultimately fell short. 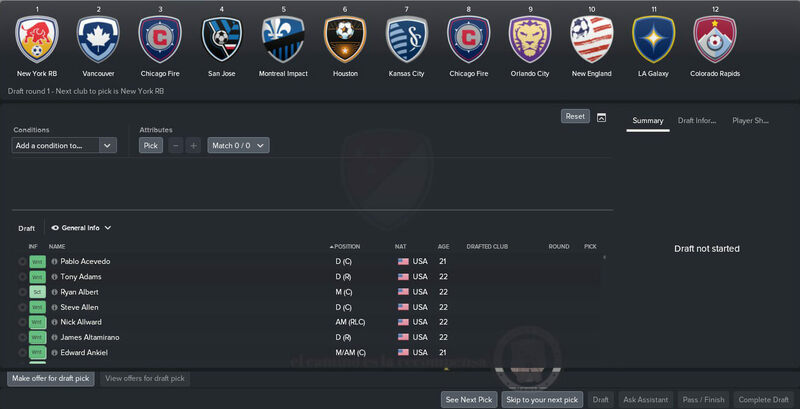 In this update, we’re going to go over two of the biggest off-season MLS events – the MLS SuperDraft in mid-January, which will be the primary topic of this post, and the late-December youth intake, which will follow. 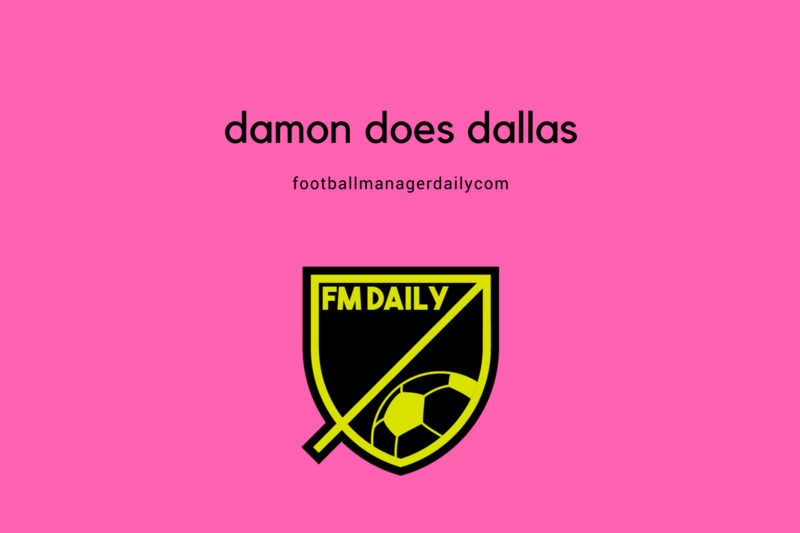 If you’re new to the series, click here for the first post in the Damon Does Dallas series. If you just need to brush up on what happened in the last update, click here. In mid-December, you’ll receive an update that looks like this from your Chief Scout or whoever you have in charge of scouting assignments. 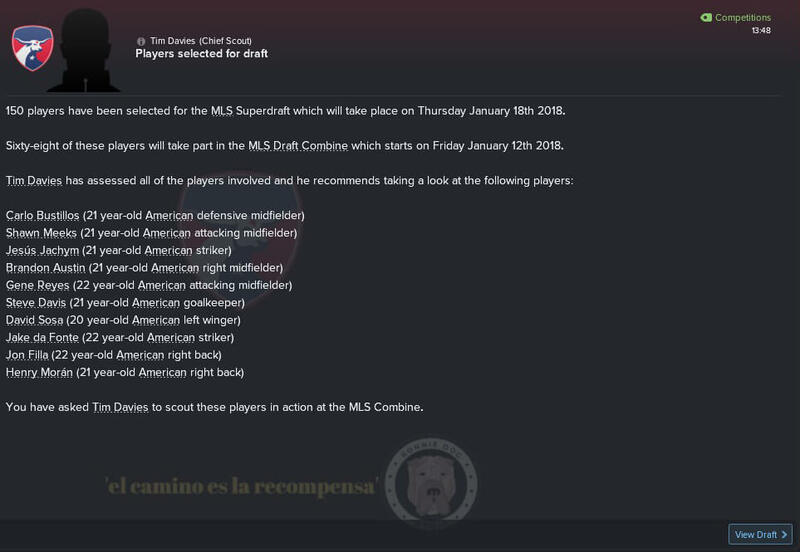 It will announce that a large number of newgens are going to be taking part in the SuperDraft next month, and you’ll be given the opportunity to get preliminary looks at the players the Chief Scout finds noteworthy, and you can instruct him to set a scouting assignment for the MLS Combines. The MLS Combines are a series of matches leading up to the SuperDraft that puts the MLS prospects against each other so that the top-level scouts can see them in action before the draft. Once the MLS Combines begin, you’ll receive updates on your scouted players and a general news piece will be sent to each MLS club announcing who was doing particularly well, and who was doing poorly, giving you the opportunity to shortlist good players or discard players who ended up performing badly. I do want to note that all of the newgens entering into the SuperDraft will be in their early 20s. These are the kids leaving amateur college/university soccer programs around the country and kids who want to step up from lower divisions into the MLS via the draft. With the right development, a good player can still become even better, but a lot of their younger years where they are more malleable and easier to quickly develop are getting behind them. In my MLS experience, once in a while, you’ll get a Matt Hedges in from the SuperDraft who will become a star player and an international, but year after year you’ll probably be dropping more of these players than you’ll be keeping, at least in my experience. The draft interface is the same as the March Waiver Draft, which we reviewed in part 3, so I’m not going to go over all of the buttons and the interface again. The order of the picks are as follows: The first pick in the SuperDraft goes to whoever finished last in the league, and then picks are reverse ordered up to the playoff positions. At that point, picks are sorted by the order teams were eliminated in the playoffs, with the winner and runner-up getting the final and penultimate picks in each round. Unlike in other drafts, SuperDraft picks can be used as chips to bargain away in a trade, so year-to-year, it’s possible for a team to have numerous picks in any given round or even miss individual rounds altogether. Obviously, it’s more valuable to a team to have a lower pick, because that gives you the opportunity to have a choice of more players and the higher quality players will still be available to you. We only traded away one pick this year, so of the five rounds, we were able to draft four players into the team, and we’ll go over those players right now and skip the minutiae of the draft. 22-year-old target man Sergio Guzman was brought in as our first-round draft pick. His personality is one of low-determination, and he’s lacking in jumping reach right now, despite being average height. 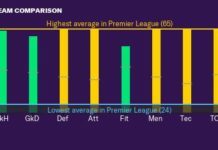 His mental attributes need some work across the board, but technically he’s doing well with most of the technical attributes needed to be successful as a target man. He’s not quite, but almost, first-team ready, and with a couple of years on reserve or taking loan spells, he is the most likely member of our SuperDraft picks to make his way into the team with the right development. I’m likely going to set him up tutoring with a senior forward in the team for the first half of the 2018 season to see what we can do with his mental attributes, and then he’ll probably be off for a loan spell for a couple of seasons before we evaluate how he is as a first-team player. Full-back Joe Justice was brought in as our next draft pick. My preference with FC Dallas is to employ wing-backs in a style reminiscent of my Central Coast Mariners days, and while he’s in physically good shape, he’s going to need some development in various technical attributes if he wants to be capable in my preferred full-back role. I’m going to set him up on a heavy regime working on technical attributes and wing-back role training, since he’s currently going to be only a backup player right now and won’t see much first-team game time at present, and we’re going to re-evaluate his position later on. I’m going to be in the market for a new wing-back this off-season, but he doesn’t fit the bill for what I want right now and will be a development project for a couple of years. 22-year-old winger Jose David Gonzalez was our third pick in the SuperDraft. Going by his current star ratings relative to the team, he’s got 1.5 starts for CA, but only 2.5 for PA. The unambitious winger just may grow and surprise me, and I wouldn’t be doing my job if I let him flounder without a chance, but unless there’s a radical change to his personality, mental attributes, and technical attributes in the next year or two, he’s likely going to be waived. Now that we’re further into the draft, the good players are gone and we’re picking at whatever is left. He still has his chance to be a good player, and I signed him and want to give him a chance since he’s versatile up and down the left flank, but he’s got a mountain to climb if he wants to be of the quality we need for an FC Dallas that’s defending the Supporters’ Shield and will be participating in the Champions League this year. Mick Claridge was brought in as our final draft pick, and while he also is almost first-team ready as a central defender, he doesn’t have much room to grow and is nearly capped out for his potential as it stands. He’s definitely a regular back-up at best to a position that’s pretty filled out right now, but if he can surprise me, he’ll have his chance in the team, though I very much see him as a player who will more likely than not be waived by the end of the next season. Maybe even in the summer transfer window if I’m not looking impressed at the performances he gives off the bench as a reserve player. Those were our four picks, and while I forgot to take an image of it, there will be one additional screen that you will see following the draft, though it’s simple enough I can just say what’s on it. At the end of the SuperDraft is a “draft performance” screen that rates teams from E to A+ like in grade school, based on how they did with the picks they were given. In our case, we were given an A-. We made the most of what we got, and after careful scouting and digging through names in the draft, we chose the best of what we could get for the roles we wanted to be filled, and we were given a pretty satisfactory rating for our draft picks this year. The SuperDraft was the main point of this post, but I have one more thing that I’m going to cover so briefly that it doesn’t merit its own article. On December 27, we had our first youth intake in charge of FC Dallas and took in a bunch of prospective 16-year-olds to join the FC Dallas Jrs. As a manager who prefers youth development over the SuperDraft, this is the screen I’m most excited to share, as we took in several high potential players. With the MLS season closing in on us and after failing to find satisfactory reserve players with sensible wages on the market who could be regulars in the team, I’ve placed a bid on three youngsters that I want to put on reserve contracts to fill depth, but I’ll review who they are and their performances in more detail at the end of the preseason. I don’t think they’re quite first-team ready, but I’d rather have something instead of nothing. I’m optimistic about these three with the right development, though! 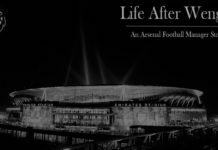 As a rule, however, I prefer to watch their development from the youth teams and not pull them so young to fill out my limited reserve slots when I can bring in a first-team ready player from elsewhere for those precious limited spaces. One last item of note: @CharlieTangoFM is poaching my players for his Swansea side! Swansea put in a bid for Kellyn Acosta, and once he got wind of it he was adamant about having an opportunity as a Premier League player. As an influential member of the team, he had a handful of players on his side wanting him to go, and I had difficulty talking him out of it. 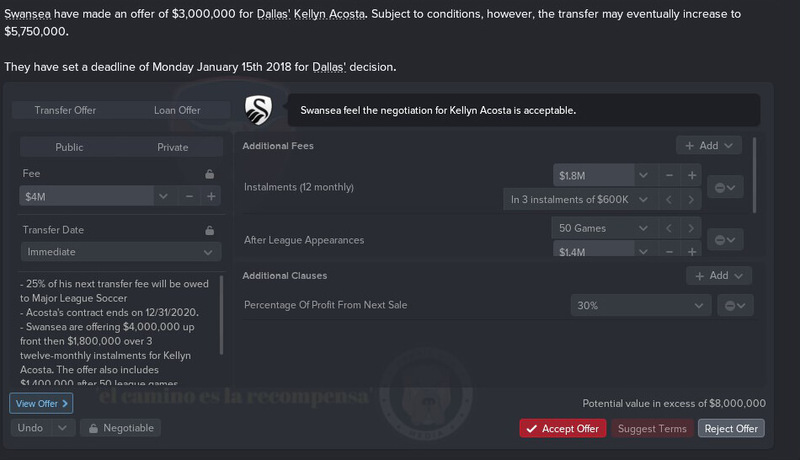 Swansea started with a low-ball of $3m, plus some additional clauses to push it to $5.75m, but I talked them up as high as I could get it and as favorably to me as possible, and we’re looking at $4m up front, $1.8m in three smaller payments (putting us already ahead of their initial offer), and we’ve got $1.4m after 50 games with the team and additional smaller numbers. A deal with the potential to rise to over $8m for the mid-20s already developed player was acceptable to me, so I’m now in the market for a new wing-back with a couple million dollars in my transfer budget now. It’s been a good season, but this is goodbye to Major League Soccer. I know, there’s a massive plot hole that isn’t closed. We set records in the league and we’re off to the Champions League. I gave serious consideration to doing a follow-up season, but since this was meant to be a tutorial on the MLS, there really isn’t much left that I could tell or show. Truthfully, I’ve also managed my hometown team so much that I need a break from the MLS. Fear not, for Daniel Sloane-Suarez’s journey as a manager isn’t over! We’re going to take on a new challenge abroad in the coming weeks, so don’t go anywhere!